GREEN PARTY MP Catherine Delahunty stunned New Zealand's Parliament today with an untabled motion supporting media freedom in West Papua. Her motion won unanimous cross-party support. Open access has been a long-standing demand by journalists and civil society advocates. The recent presidential vote has offered a chance for major changes in the Jakarta-ruled two provinces of Papua and West Papua, collectively known as the region of West Papua. I move that this House call upon the new President of Indonesia to commit to genuine media freedom in West Papua including the right of local and international journalists to report on the political situation there without risk of imprisonment or harassment by the Indonesian state. 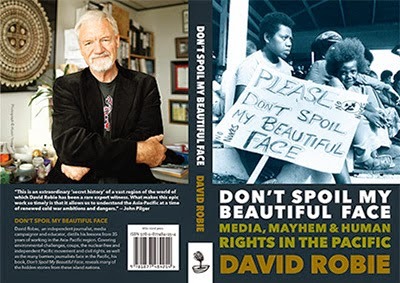 Brent Edwards in The Walkley Magazine looks at journalist and academic David Robie’s scrutiny of the Pacific region’s governance and journalism. Cartoon by David Pope. 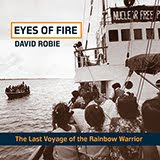 DAVID ROBIE has spent 35 years working as a journalist and journalism academic in the Asia- Pacific region. 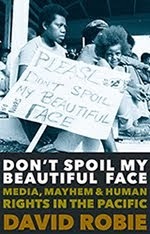 In Don’t Spoil My Beautiful Face: Media, mayhem and human rights in the Pacific, Robie summarises his reportage on many of the significant events that have marked his years working in the Pacific. It is part autobiography, part history and part journalism treatise. As well as providing his perceptive analysis of human rights and democracy, or lack of, in the Pacific, Robie also spends time commenting on journalistic practices, particularly as they relate to reporting on our immediate neighbourhood. For someone like me, who is not an expert on the Pacific, the book is a valuable reference to the significant issues that continue to bedevil the region. Robie’s book is broad in its compass. 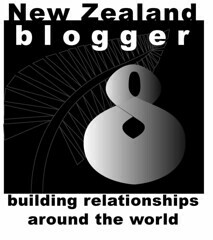 It covers the Kanaky struggle for self-determination in New Caledonia, the rise of the Flosse dynasty in Tahiti, coups in Fiji, Chinese influence in Tonga, the struggle in Bougainville, the fight for independence in Timor Leste, the ongoing struggle in West Papua and the bombing of the Rainbow Warrior in Auckland in New Zealand. His stories range as far away as covering indigenous struggles in Canada to the violence in the Philippines. And always he is concerned with human rights in the Pacific. Robie includes articles he has written over the past 30 years or so, updated by his contemporary analysis of what is happening now. Take New Caledonia for instance. That chapter includes an article Robie wrote for the New Zealand Listener in 1984 titled “Blood on their banner”. He writes that his reporting on New Caledonia led to a protracted and acrimonious dispute with Fiji’s Islands Business publisher Robert Keith-Reid, when the magazine accused him in 1989 of alleged “leftist” support of Kanak activists. It is just one example of the pressure that has been exerted on Robie and other journalists over their coverage of independence movements in the region. But it is Robie’s comments on the practice of journalism that should excite the most debate. He makes no bones about his distaste of the tendency of regimes and other vested interests in the region trying to suppress press freedoms, often by intimidation and threats. His views on journalism in the region have not just been shaped by his experience as a journalist. 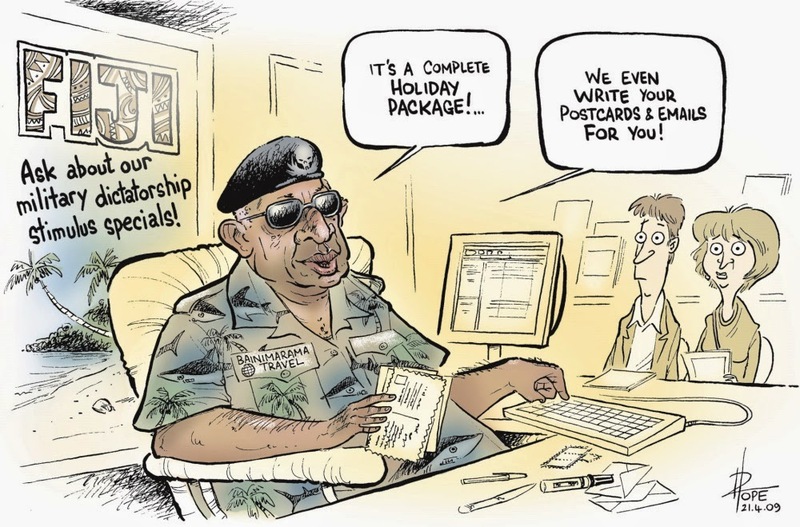 He has also been the head of journalism at both the universities of Papua New Guinea and the South Pacific and he is now journalism professor and director of the AUT University’s Pacific Media Centre in Auckland. He praises those journalists throughout the region who struggle to do their job in the face of intimidation, legal restraints and poor pay. But he is less effusive about the role of Western journalism in covering the Pacific. He questions whether the Western notion of news is appropriate to covering the many complex issues in the region. And, before some journalists protest too loudly, this is not a cry for the media to go soft. But Robie does raise some interesting questions about the role of journalism and whether its approach could be altered. Robie puts forward the case for journalists practising what he calls critical deliberative journalism in the region. He argues that Pacific journalists now have a greater task than ever in encouraging democratisation of the region and informed insights into development, social justice and peace issues facing related island states. In other words, he says journalists should be part of the solution, not part of the problem. Robie says this does not mean allowing politicians’ slogans, such as “cultural sensitivity”, to be used as a smokescreen for the abuse of power and violations of human rights. Instead, he says the approach he advocates will put greater pressure on journalists to expose the truth and report on alternatives and solutions. Those questions do not just apply to the island states. Here in Australia and New Zealand we, too, might consider a different approach to the way we practise journalism. The Walkley Magazine publication. Republished on this blog with permission. AN EXTRAORDINARY story of mining skulduggery and a courageous struggle by indigenous Kanak environmental campaigners has been captured in a poignant new documentary, Cap Bocage – described by the filmmaker as a tale of “when a mountain fell into the sea”. The culprit in this case is Ballande, one of the oldest nickel mining companies in New Caledonia with a record of three decades laying waste a coastal environment in north-east Grande Terre. The documentary, made by director Jim Marbook, filmmaker and also a television and screen production lecturer in AUT University’s School of Communication Studies, is an astute piece of cinematography. Made over a period of seven years, it patiently peels away all the complexities and subtleties of the environmental struggle against a hard-nosed mining company that employs most of the people in the remote Kanak community. It also tells the story of articulate and charismatic campaigner Florent Eurisouké – who visited Auckland for the global premiere at this week’s New Zealand International Film Festival – and his environmental organisation Mèè Rhaari take on Ballande through boycotts and finally the lawcourts.